In this stunning first novel, Mary Sutter is a brilliant, headstrong midwife from Albany, New York, who dreams of becoming a surgeon. Determined to overcome the prejudices against women in medicine-and eager to run away from her recent heartbreak- Mary leaves home and travels to Washington, D.C. to help tend the legions of Civil War wounded. Under the guidance of William Stipp and James Blevens-two surgeons who fall unwittingly in love with Mary's courage, will, and stubbornness in the face of suffering-and resisting her mother's pleas to return home to help with the birth of her twin sister's baby, Mary pursues her medical career in the desperately overwhelmed hospitals of the capital. Like Charles Frazier's "Cold Mountain" and Robert Hicks's "The Widow of the South, My Name Is Mary Sutter" powerfully evokes the atmosphere of the period. 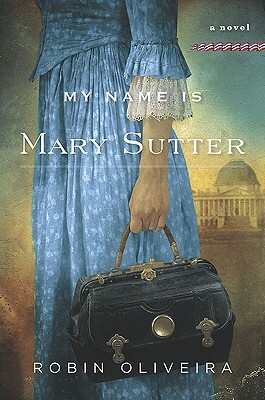 Rich with historical detail (including marvelous depictions of Lincoln, Dorothea Dix, General McClellan, and John Hay among others), and full of the tragedies and challenges of wartime, "My Name Is Mary Sutter" is an exceptional novel. And in Mary herself, Robin Oliveira has created a truly unforgettable heroine whose unwavering determination and vulnerability will resonate with readers everywhere. Robin Oliveria received an MFA in writing from Vermont College of Fine Arts and was awarded the James Jones First Novel Fellowship for a work-in-progress for "My Name Is Mary Sutter." She lives in Seattle, Washington, with her husband and two children.
" ...riveting saga about trying to break a 19th-century glass ceiling." "Oliveira's debut novel is magnificent historical fiction." "The language is beautiful and the story will keep you on the edge of your seat throughout ..."
" ...compelling voice ... does a splendid job of reminding us how much the known world has changed ... and how much has not." "Oliveira deftly depicts the chaotic aftermath of battles and develops her own characters while incorporating military and political leaders of the time. The historic details enrich the narrative without overshadowing Mary's struggles. This well-written and compelling debut will engage all readers of historical fiction, especially those interested in the Civil War."